Welcome to Session number 14 of the Europe Million Dollar Case Study. Wow, I can’t believe we have got this far already. Time is flying past, and in that time, a lot of progress has been made. In this week’s session we had a special guest, Richard Gilbert, from Payoneer joining us, to talk to us about managing payments as an international seller. This is pretty important stuff, as it involves how you get paid, and how to save as much money as possible on converting international revenue streams. Great stuff! Before we get into all of the insightful stuff Richard had to share, here’s a few Jungle Slumber updates for you! I have sent a full brief to a photographer in the UK, and the supplier has sent a sample over to them. I paid for the shipping for the sample via PayPal, easy peasy! Production is still well underway and the factory are getting through the order of 1500pcs day and night. I will be looking to send around 300 units by air to get them into stock over at the Amazon distribution center in the UK as soon as possible, for the purposes of this case study. I probably wouldn’t do this if this product was not a part of MDCS, as it’s more costly, especially for a heavier item. However, it is still something to bear in mind if you are in a rush and your product isn’t too expensive to air freight. The wheels are also in motion on the product listing content, which I am working on in the background whilst the shipping and photography are taking place. Set up a Europe Seller Central account, you will need this so that you can create an FNSKU barcode (more on this in Session #) and create a shipping plan (more on this in Session #) and get the relevant labels for your shipment. Of course, if you are just joining and thinking what the flip, where am I? What did I miss? You can catch up on all sessions right here. Logistics and compliance – This is actually something Amazon FBA makes considerably easier for us, because you can send your inventory to Amazon and have them manage the rest, even if you are fulfilling across Europe. Sure, it’s more difficult to run a Pan-EU Amazon business, but then it would be even more difficult to run your own ecommerce store if you were selling in those same markets. Language and localization – For example, translation, customer support across languages and understanding the nuances in demand across marketplaces. Payment and currencies – What we will cover today, how to get the most out of converting money you make in other currencies into your home/primary currency. None of these challenges are insurmountable, as we have discovered throughout this case study. I have never sold anything on Amazon before, or had an ecommerce business. But with the right education and the right suppliers and partners at my side, there has been no part in the journey that I haven’t been able to figure out and overcome. Here’s the bit you really need to know, in order to make a decision on how to manage payments for your business. Let’s assume that most sellers or soon-to-be sellers won’t opt for the second option right now, so how does Amazon’s ACCS service compare to a third party? What Exactly is an Exchange Rate Margin? Richard explains this really well in the webinar so make sure you have a listen to the replay. To put it simply, currency and conversion rates are a result of banks trading currencies with each other in large volumes. The rates are set according to the buy and sell and demand, and the rates banks trade with each other is called ‘Inter-bank’ or ‘Mid-market’ rate. Then there is a percentage added on to each transaction called ‘Spread’ or ‘Margin’. This is how banks, Amazon, or a third party service makes money on your conversions. The reason a third party like Payoneer has better margins compared to Amazon is because they buy in bulk from the banks. OK, So How Does This Affect My Profits? There is nothing wrong with using Amazon’s service, especially when you are starting out for the convenience factor. But once you start to make serious revenue, you will definitely benefit from having better conversion rates, to the tune of thousands of dollars, pounds or euros! By this point, you are probably wondering how third party services allow you to convert currencies and pay your suppliers or VAT obligations. 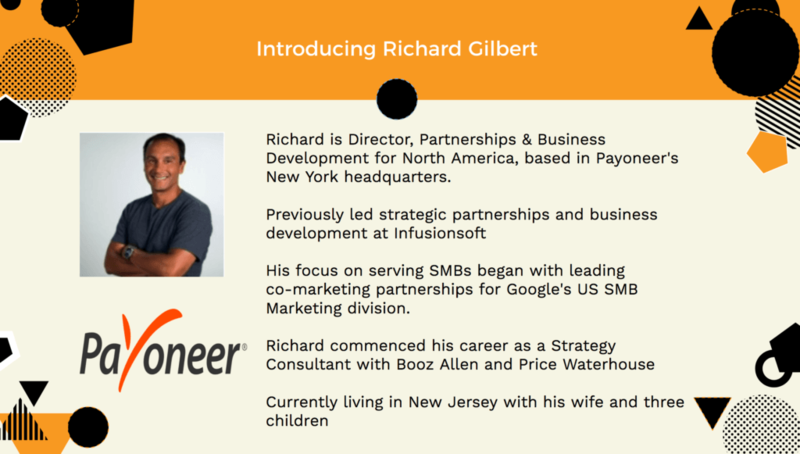 As Richard explains, this is usually done by setting up local accounts across marketplaces. So you effectively do end up with local bank accounts in all of your marketplaces through a third party service, without the extra hassle of having to fly around the world to set them up. This means you can either transfer money to your own bank account and home currency, or keep funds in your local accounts in order to pay for your business expenses. This could be your accountant, your freight forwarder, your supplier and even your VAT. If you are a US seller doing business in the UK, using a UK accountant, then you would pay your accountant and your VAT in GBP. So it would make sense to keep some of your revenue from Amazon.co.uk in this currency, rather than convert it to dollars, only to convert it back to pounds again to pay for these things. This becomes even more effective if you are selling across European marketplaces and owe VAT in different countries. In addition, Payoneer has other cool features too, such as the ability to get bank cards for your account, as well as a growing network of suppliers who are on the Payoneer network, which means you can pay suppliers for free. If you’re already an international seller, or just about to become one like me, make sure you check out Payoneer and find out more about their services as a third party option for managing your Amazon payments. 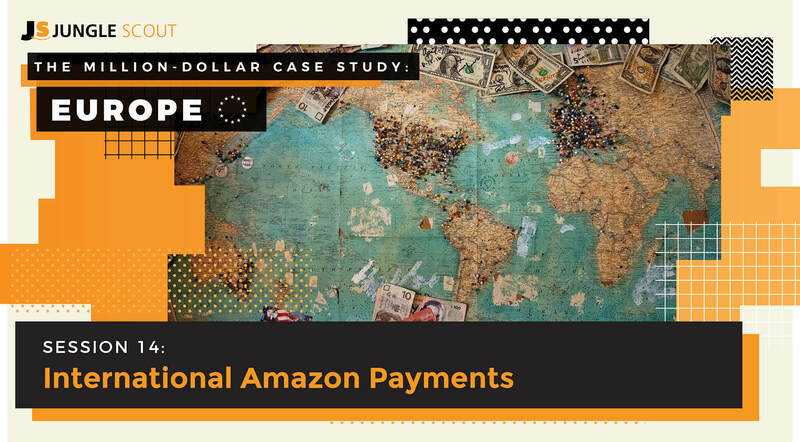 Getting paid is a pretty important part of running your Amazon business, so if you haven’t already made up your mind, think about how you want to manage your international payments. In the next session, we take a look at the latest Amazon product launch strategies for Europe and elsewhere! Makes sure you check it out, this part of the process is super important. Check out the Web App we’ve used during the Million Dollar Case Study! PAYONEER can Not be trusted. They said they paid my bank account but no money received. after my complain by telephone and email they simply said it’s under investigation. it’s nearly 1 month now and still nothing happened. .Does amazon provides support apart from Amazon Incl. If not then when it will be available?? We expanded the Jungle Scout marketplace support this year to all of North America, India, Mexico and across Europe. We may also extend the tools to support other marketplaces in future like Japan and Australia, but I’m not sure when this will be. Make sure you sign up for our newsletter if you want to receive our product and Amazon updates. I’m also eagerly awaiting the support for Amazon Japan!! Hi David. Have you had any luck finding other tools for Amazon Japan? Have you heard about this? Or are they f*ing with me? Hmmm, this does sound odd, but then again I have no idea how tax systems work in China or with Alibaba Trade Assurance. Trade assurance is basically an added layer of protection offered by Alibaba as I understand it, you give your money to Alibaba Trade Assurance (still using a T/T transfer) – then I think they function like an escrow service and pay that money to the supplier. I would ask them to elaborate on this, and dig deeper for information… or see if they can provide any documentation from Alibaba about how it works maybe? Also perhaps post a message in an FBA facebook group to see if you can crowdsource further advice —> FBA competitive edge. Trade Assurance is quite new, and I think some suppliers may still be reluctant to use it. They may be telling the truth and you have nothing to worry about. But I totally understand why you want to make sure. If I find out any other info I will drop you a line. I’m wondering if you will be using a 3rd party inspection? Could you talk a bit about that? Will they destroy your products? How many would you have them test? etc. ? I think this can cost you a lot, if you make a mistake, right? I’m curious what your approach is? We have used the same inspection company for all of the case study products and as far as I know this inspection is more to check the items are made to the exact specification and everything is in order. I am sure you can request more “destructive” inspections, but that’s not really required for a private label seller. For example, for the sleeping bags we want them to be inspected to ensure they all meet the specifications in terms of quality, materials used, printing, labelling, colors and so on. It can also be a useful step in the process if you are launching a product with specific requirements for safety. We worked the inspection into the supplier agreement and they have agreed that if any items do not pass inspection then the supplier will re-manufacture them at no extra cost. So this is how we minimize any negative cost impacts. Following this amazing case study as I’ve recently opened my own amazon fulfilment centre here in the UK. This is geared towards those that don’t want to send products direct to amazon but rather have them checked by a 3rd party like ours and then onward ship to amazon with all the correct paperwork and shipping labels. I was wondering when you will be supplying your service to Amazon Australia Amazon.com.au. Are you asking with regards to recent news about Amazon Australia launching soon? In terms of the Jungle Scout tools, we strive to make them available for all Amazon marketplaces, so this may be a thing that we release in future. Additionally, with regards to this webinar session, I believe Payoneer is already a solution that is already used by many Australian sellers who sell in the US or other marketplaces. Great question and Kym did an awesome job directing you to our Blog on this topic which provides a very good overview. It is true that to use Make A Payment to pay local suppliers in their currency, you need their email address. For VAT payments our sellers access a form within their Payoneer account portal where they supply their VAT registration # and the VAT filing reference number along with the amount they wish to have sent by Payoneer to the appropriate tax authority. Payoneer solution will confirm these details with the seller and then send it directly to their account. We can perform direct payments for UK, Germany, Poland, Czech Republic. In countries such as Spain, payment must be made through a Spanish Fiscal Representative. In these scenarios we are partnering with Fiscal Reps to accept Make A Payment to transfer the funds needed to remit to the Spanish Tax Authority. Just one question, in order to do payments with payoneer, you need to enter the email from the recipient, so, how are you going to pay the vat with this service? Also if your accountant and supplier do not use payoneer, how will you pay them? I’m not sure about entering the email address with regards to paying your VAT. But here’s a blog post on their website about it – plus I am sure if you ever got stuck their support team would help you out. When it comes to paying your accountant and supplier… if they are on the Payoneer network then I believe you can simply transfer the funds within Payoneer and pay no fees at all. If they are not in the Payoneer network then you would process a payment to them in a similar way that you would process a wire transfer from your regular bank. The benefits of using services like Payoneer to this are that they have better conversion rates and lower fees than your bank. It also comes in handy as an international seller as it means converting your profits less. For example: If you are a US citizen and you are selling in Europe, you will get paid from Amazon in Euros / GBP. Using a third party like Payoneer means you can keep some of your income in that currency, and pay your European accountant from Payoneer. Rather than converting your Euros and Pounds to Dollars, and then converting them back again to pay your accountant in their local currency.